We loved our quad ride so much yesterday that we rode the quads again to reach the runway up in the Hartmann valley. A lovely one-hour drive at sunrise. The flight from Serra Cafema to Naankuse, near Windhoek, was the one I had been looking forward to since the starting day. We flew over the red sand of the Hartmann Valley and then headed toward the coast, where we soared through the Skeleton Coast National Park. The usual morning fog created by the Benguela current was coming in but not thick enough to prevent us from flying low over elephants tracks, seals, and powerful waves. (Watch the video below. The altimeter is indicating zero feet!) This was my favorite flight so far…. The fog soon came in stronger, so we had to fly above it and started getting a bit worried about landing at Swakopmund, which has no instrument approaches. While we were thinking about deviating to Walvis Bay, the fog kindly gave way and allowed us to get to Swakopmund. A quick refueling, and then we headed to Naankuse over a moonlike landscape. The landing here was the one we were most anxious about…. Last year the “runway” was just a narrow road. This year it has been largely improved, yet we somehow missed the thrills of having to do a real bush landing. Naankuse is a not-for-profit ecolodge that hosts rescued wildlife. We will have the special opportunity here for close encounters with big cats. I will now divert a bit off topic, but this blog is a description of our emotions during this trip…. This morning when we landed at Swakopmund, we had internet access after few days of “black out.” We learned that our eight-year-old son Jacopo had badly broken his arm, which he had already fractured last Christmas. Not easy news to digest…. He had successful surgery, two plates were inserted, and he is about to be dismissed from the hospital. We decided to stay here and carry on hosting our air expedition. Jacopo is in good hands with Stefano and his great Kanzi Academy teacher, Sarah. We have reached the halfway point of our epic journey. We have now flown 3,230 miles, and we have 3,570 miles ahead of us. This morning we say goodbye to Robert and Claire, Louis and Annemarie, and Rebecca. Louis told me this was the best trip he has ever taken. Very rewarding for me after ten months of planning…. We also say welcome to Veronika, who is joining us today from New York. 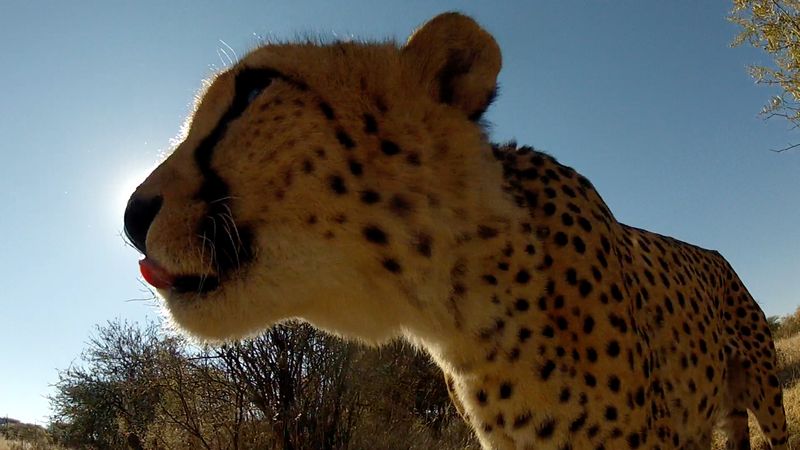 Our planned walk with Kiki, the cheetah we walked with last year, did not take place. She was not feeling well. We spent the morning instead with her brother and sister, who were incredibly charming. We then visited the other animals kept here, all saved from farms where their parents died at the hand of the farmers. Yes, tolerance of wildlife by a commercial farmer is usually equal to almost nil…. We visited two leopard brothers, who are kept in a nine-hectare enclosure. We then saw a huge lion and his two sisters, who were all very active ( too active for Antonella’s nerves when the lion charged the fence…). A family of thirteen wild dogs and three caracals ended a great morning. We look forward to this evening under the stars when we will hear bushmen stories…. Read more about Air Safari in Kenya.